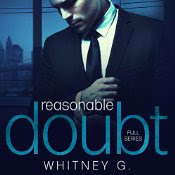 Audible Book Review, Reasonable Doubt (Full Series) by Whitney G.
Would you consider the audio edition of Reasonable Doubt to be better than the print version? I have only heard the audio edition. What was one of the most memorable moments of Reasonable Doubt? God! Where to start! Everything, I think, every moment, every conversation between Aubrey and Andrew are off the charts hot and are fuelled with so much sexual tension the result is EXPLOSIVE! I couldn’t say something without giving away some important part of the story, but all I can say is this book blew my mind, Once I started I couldn’t stopped and did the whole 8+ hours in one sitting! Have you listened to any of Sebastian York and Erin Mallon ’s other performances? How does this one compare? This is the first I heard from both and I thought they were remarkable, Erin was brilliant with the voice transitions. Sebastian has ruined me for anyone else. Yes and I did, the story is compelling, it flows easily and you are constantly at the edge of your seat wanting to know what is happening. I absolutely 100% know the story is perfection but the narrators brought it to life. I recommend this book so much to all lovers of romance/billionaires/angst and Alpha males. I am only upset it has taken me too long to uncover this wonderful Author. It certainly won’t be the last I hear/read from her. THIS IS PURE CLASS.